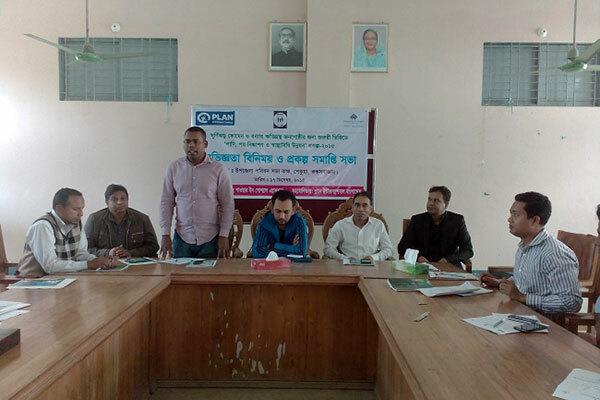 Experience sharing and project closing meeting of Emergency WASH support to the people South-East flood and Cyclone KOMEN held on 17 Dec’15 at Upazilla hall room, Pekua, Cox’s bazar. Mr. Safayet Aziz Rajo, Upazilla Chairman was present as chief guest while Mr. Md. Marofur Rashid khan, UNO, Pekua, Cox’s bazar presided over the meeting. Mr. Mahabubur Rahman, Director (SDP), Mr. Palash Chowdhury, Director (Finance), Mr. Krishibid Dulal Miah, Plan International Bangladesh, Chairman of Barabakia Union and Mognama Union, Pekua, GO, NGO, Journalist, Civil society representatives were also present at the meeting. Md. Harun, PM, YPSA-WASH presented the project overview, target and achievement. UNO appreciated YPSA’s work basically beneficiary selection process, water and sanitation service and close monitoring without any objection. He gave thanks to PLAN International Bangladesh for their Emergency WASH program and Margaret A.Cargill Foundation (America) for their financial support.